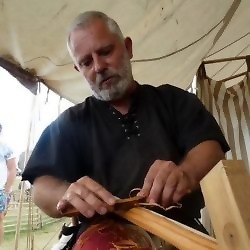 Tom has been making English longbows for over 50 years and specializes in making self yew longbows based on those raised from the Tudor Warship Mary Rose. shooting a yew bow is one of life's great pleasures, a yew bow will become a part of you if you give it the chance and together you will have many rewarding hours shooting. Tom is also a skilled blacksmith specializing in historical pieces such as arrow heads.